For the love of all that is good and holy in this world, give Leonardo DiCaprio his long-overdue Academy Award! This was all I was thinking as I sat through Alejandro González Iñárritu’s new film, The Revenant. Apart from the infinite number of beautiful shots depicting the American West through virtually all climates, my attention was fixed on the memorable performance of its lead, our boy Leo. This is not the Leo from post-Titanic Leo-mania, whom my cousins fell in love with and helped contribute to James Cameron’s romantic drama’s reigning status as the highest grossing film of all time until 2010. 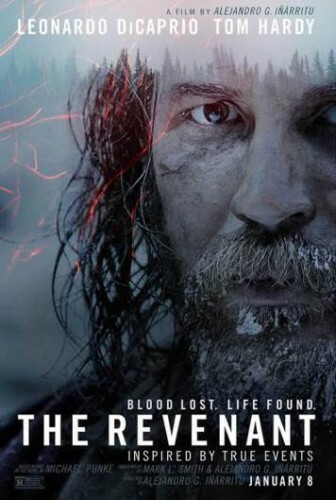 This is a gritty and horrific depiction of a man who survives a brutal bear attack and must endure the cold of winter in order to trek across the wilderness in order to fulfill a quest for revenge on John Fitzgerald, played by Tom Hardy, who decided to leave him for dead. This is a memorable performance on DiCaprio’s part. And while its acclaim may not be based in eloquent command of speech, as legendary Shakespearean actors like Olivier, McKellen, Gielgud, or the chilling sophistication of Anthony Hopkins as the cannibalistic serial killer, Dr. Hannibal Lecter, DiCaprio’s run as Hugh Glass will forever be etched into our minds due to his conveyance of pain. Foaming at the mouth, shouting through his teeth and unable to make intelligible sounds, lighting gunpowder in an open wound on his neck in order to clot the bleeding, this man, we must believe, truly did survive a bear attack. There is no question. In fact, he does not speak much throughout the movie as he journeys back home. On top of (spoiler alert) pulling a move in which he imitates Han Solo providing a seriously injured Luke Skywalker shelter in a dead tauntaun in The Empire Strikes Back … give him the Oscar right now! Another performance that must be recognized is that of Englishman Tom Hardy, who takes on a Southern accent and ultimately gives it a creepy delivery, reminding us of the yokels seen in Deliverance or Errol Childress in the first season of True Detective. Hardy has also lent his unique voice to another character best remembered for his speech, the villain Bane in The Dark Knight Rises. It is as if the lack of speech on DiCaprio’s part is made up for by Hardy’s yokel delivery. My complaint about this film is the depiction of Glass’ journey back to his home fort is a bit dragged out at times, and could have been cut shorter. Award season is approaching us, and DiCaprio has already won a Golden Globe and a Screen Actors Guild Award, and he has received his fifth acting-based Academy Award nomination, having already lost to Tommy Lee Jones, Jamie Foxx, Forest Whitaker, and Matthew McConaughey. And we have all seen the internet memes poking fun at his losses, such as placing his head on Mr. Turner in a memorable scene from The Fairly Odd Parents, and losing to Jennifer Lawrence despite being the only listed candidate for an award. Another meme came forward that was not connected to his snubs, but depicted his audience with Pope Francis, in which the Pontiff tells him that he was rooting for the bear earlier in the movie. Iñárritu may also have a great chance to win his second consecutive Best Director Oscar, having last year won for Birdman. Nobody can argue with his ability to depict the American pioneer life, as well as masterfully paint the picture of Glass’s revenge. But even if Iñárritu wins again, his victory will definitely be overshadowed by the anticipation of Leonardo DiCaprio, one of the finest living actors of our generation.